Books, music, artworks and memorials help ensure that victims of pandemics are remembered. But while the Black Death, AIDS and Ebola outbreaks are firmly part of our collective cultural memory, the Spanish flu outbreak has not been. Medical historian and author Mark Honigsbaum explains why. In June 1987, a group of activists gathered in San Francisco to pay their respects to friends and lovers who had recently died of AIDS. At a time when many victims of the ‘gay plague’ – as the disease was then referred to in the media – were being denied religious burials, it felt important to honour them. To ensure the deceased were not forgotten, Cleve Jones, a San Francisco gay activist, hit on the idea of painting the names of 40 AIDS victims on placards and hanging them from the balcony of City Hall. 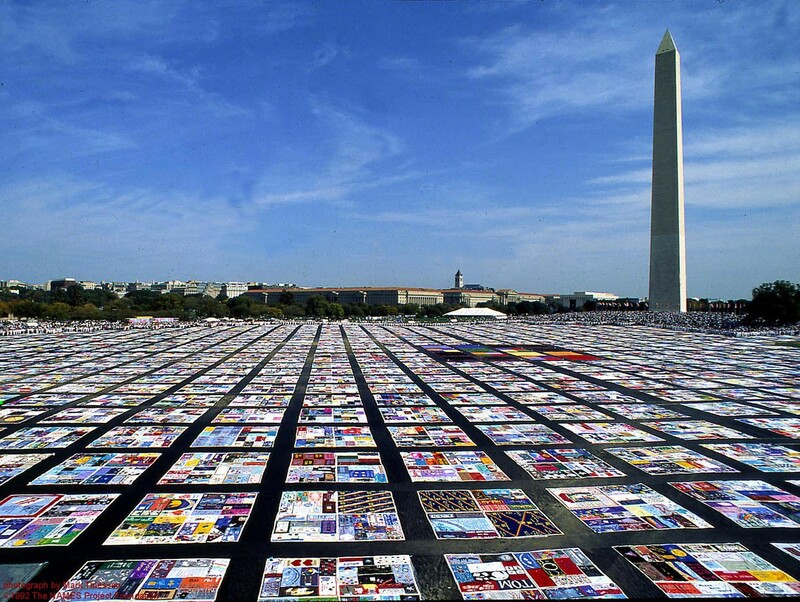 The AIDS Memorial Quilt was embroidered with the names of 1,920 victims. Lined up beside each other, the placards resembled nothing so much as a quilt. What, wondered Jones, if he were to make a real quilt with each panel measuring the size of an average grave? And what if the panels were laid head to toe at a national landmark? It would be a fitting memorial and, he reasoned, a symbol politicians would find impossible to ignore. 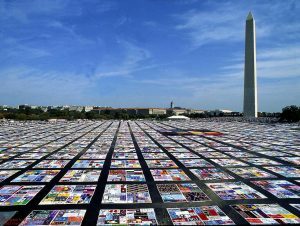 So it was that in October 1987, on the occasion of a mass march for lesbian and gay rights in Washington DC, the first section of the AIDS Memorial Quilt, embroidered with the names of 1,920 victims, was laid on the National Mall. Today the quilt has nearly 50,000 panels and weighs approximately 54 tons, making it the largest piece of community folk art in the world and, more importantly, the weightiest memorial to any pandemic in history. AIDS is not the only pandemic to have inspired artistic productions. In the wake of the 14th-century Black Death, artists decorated churches and the tombs of victims with macabre images of dancing skeletons, a reference to the mania for dancing that gripped towns and villages in the path of the plague bacillus. By the 16th century, the recurrent European experience of plague had spurred an artistic cottage industry, with portrait painters like Albrecht Dürer and Frans Hals depicting wealthy patrons holding skulls and other memento mori as reminders of their mortality. 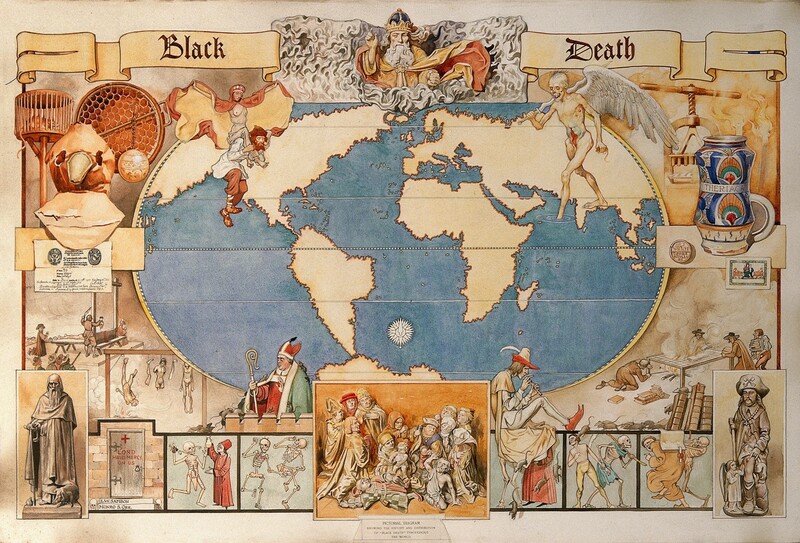 The Black Death inspired many artists to decorate churches and the tombs of victims with macabre images of dancing skeletons. But what of a pandemic that killed far more than AIDS and Ebola combined? But even in this, the centenary year of the pandemic, you will find no memorials to the Spanish flu to compare with the AIDS quilt, and few graveyards commemorating the sacrifice of doctors and nurses. Nor will you find many novels, songs or works of art from the period that refer to the 1918 pandemic. This absence of artistic responses and conscious acts of public remembrance puzzled commentators at the time. “There is some psychological interest in the fact… that actually the emotional impression created [by the influenza pandemic] was fainter than that produced by much less grave epidemiological happening,” observed Major Greenwood – a classically trained scholar and epidemiologist who helped compile the official British government report on the pandemic – in his 1935 book ‘Epidemics and Crowd-Diseases: An Introduction to the Study of Epidemiology’. 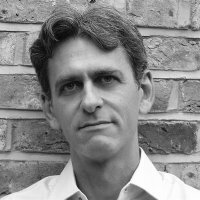 Crosby’s book was originally entitled ‘Epidemic and Peace’.But in 1989, in the wake of the AIDS pandemic, his publishers reissued the title as ‘America’s Forgotten Pandemic’, thereby counterposing the grief, shock, and horror of AIDS with the cultural amnesia then surrounding the Spanish flu. So what causes some epidemics and pandemics to be forgotten and others to be remembered? To answer that, we need to understand how the flu struck people at the time. The Spanish flu killed an estimated 50–100 million people. 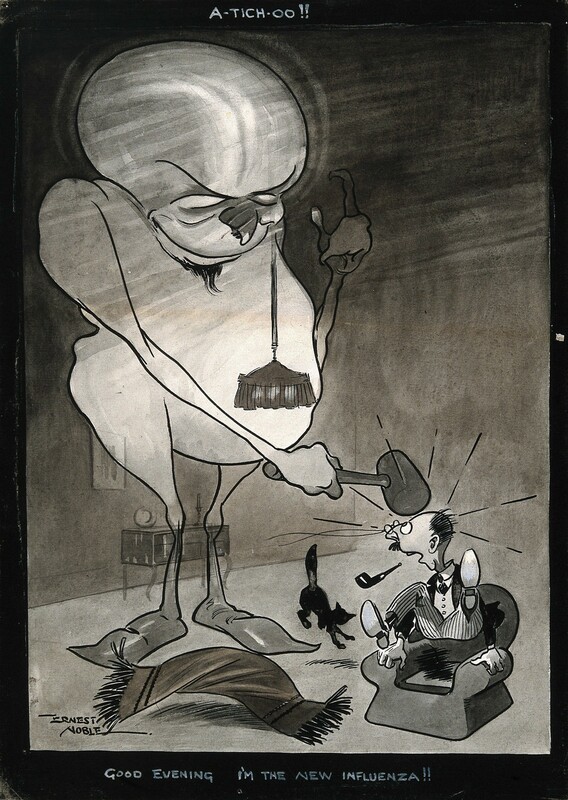 This drawing from 1918 depicts a monster representing an influenza virus hitting a man over the head as he sits in his armchair. While 100m is an impressive number, those deaths were spread around the globe, and in the case of Britain (225,000 deaths) and the United States (675,000 deaths) represented just 2 per cent of those countries’ populations. Even in India, where the Spanish flu is estimated to have killed 18.5m, the mortality rate was just 6 per cent. 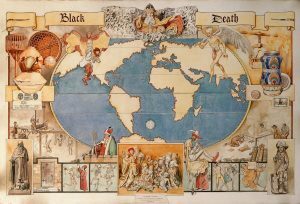 By contrast, the Black Death is estimated to have killed between 30 to 60 per cent of Europe’s population in the middle decades of the 14th century (40–70m people, as Suzanna Austin calculates in ‘A Pest in the Land: new world epidemics in a global perspective’, published in 2003). At a time when Europe’s population was already much reduced by famine, the repeated waves of plague also had a profound demographic effect, resulting in a shortage of agricultural labourers. This increased the bargaining power of the peasants and, according to some historians, precipitated the collapse of the feudal system. What about the deaths themselves? The final stage of the Spanish flu was a grisly affair, with the worst-affected individuals succumbing to a condition called cyanosis that saw their lips, cheeks and ears turn a purple-blue colour as their lungs filled with choking fluids. But while the cyanosis was invariably fatal, the symptoms presented in only about half of the pulmonary cases and most of the deaths occurred behind closed doors in the privacy of people’s homes. Contrast this with Karposi’s sarcoma, the alarming skin condition that, coupled with the visible wasting of muscle and flesh, made early AIDS patients so shocking to behold. In the early years of the pandemic, AIDS seemed to single out gay men and other so-called ‘at-risk groups’, such as Haitians and heroin users. As churches refused to bury victims and schools barred haemophiliacs infected with the virus through contaminated blood products, it is unsurprising that the shame and grief of friends and family members quickly turned to anger and demands for political change. 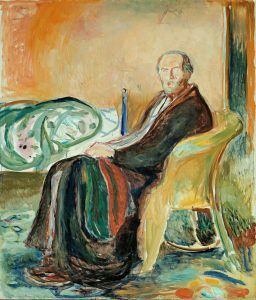 Edvard Munch’s ‘Self-Portrait with the Spanish Flu’ is one of few pieces of art documenting this condition. He did not die from the illness. By contrast, even when the Spanish flu mutated into a virulent killer in the autumn of 1918, most of the deaths were compressed into a short four-week period, with the mortality falling on a wide cross-section of society. Cutting across social, sexual and ethnic lines, it did not become a vehicle for stigma or a motor for outrage. 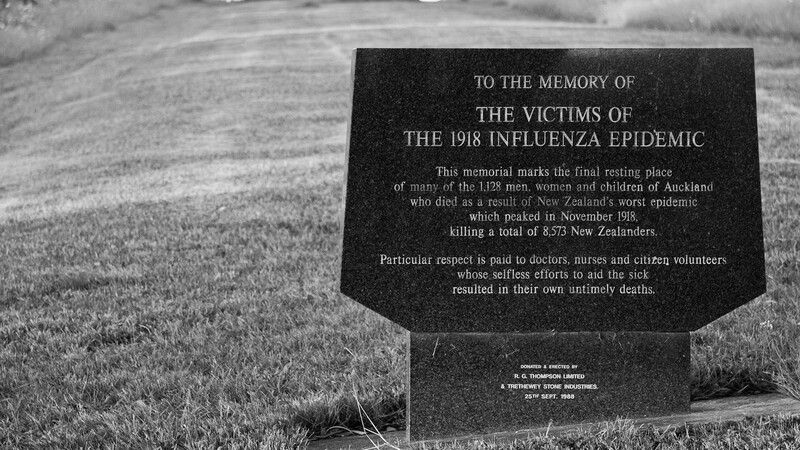 But perhaps the biggest reason for the absence of public memorials to the Spanish flu is the impossibility of imagining deaths on such a scale. In his novel ‘The Plague’, Albert Camus describes the many millions of bodies from the past as no more than an intangible mist drifting through the mind. However, in this, the centenary year of the pandemic, that may be changing. To coincide with the 100th anniversary of the deadly autumn wave, the Florence Nightingale Museum opened a new exhibition in September 2018 inviting us to remember the wartime experiences of doctors and nurses, many of whom sacrificed their lives caring for flu patients. Volunteer nurses from the American Red Cross tended to influenza sufferers in the Oakland Municipal Auditorium, California, during the 1918 pandemic. 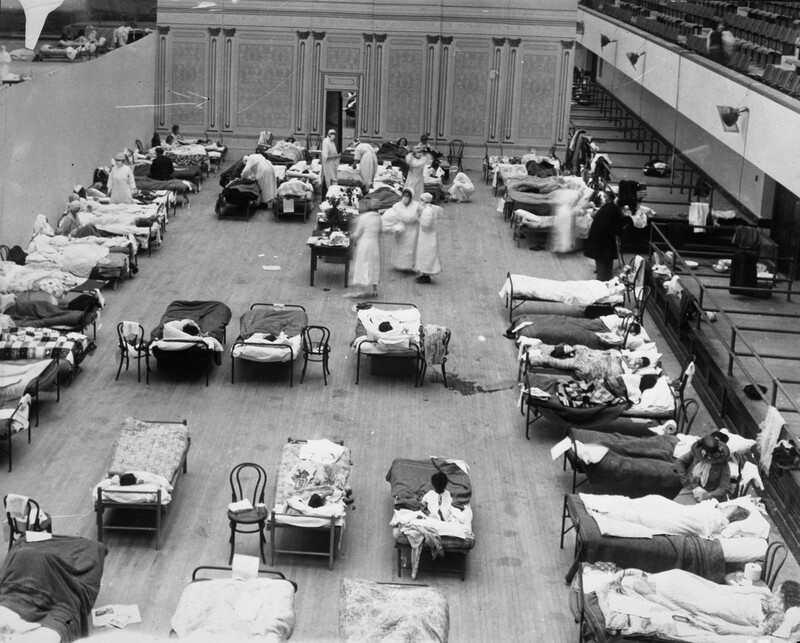 And the BBC aired a one-hour historical drama entitled ‘The Flu That Killed 50 Million’, using actors to recreate the experiences of soldiers and civilians caught up in the successive waves of illness and the faltering response of British health officials. This will be followed by a major digital installation from the artist Jordan Baseman commissioned by Wellcome, recalling the ‘everyday experience’ of the flu through a series of soundtracks entitled ‘Radio Influenza’. Publishers are also responding, with one medical historian, better known for his writings on the Black Death, referring to the Spanish flu in his new book as the “Great One”. The result is that there is no longer a danger of the 1918 pandemic being forgotten. On the contrary, in 2018, writers and artists might finally give the Spanish flu the memorial it deserves. This entry was posted in Disease, History. Bookmark the permalink.